Wide, uncrowded beaches, pristine white sand dunes, gated resort community, breathtaking vistas, two championship golf courses, a tennis center featuring 15 Har-Tru composition courts, two oceanview pools (one heated) plus baby pool, fitness center, full-service equestrian center offering beachside riding, a nearby marina, tidal creeks for the kayaking enthusiast and daily dolphin sightings for the kid in all of us! Enjoy it all while staying in a tastefully decorated private home that is fully-equipped with all of the comforts of home. Enjoy fabulous ocean breezes and beautiful sunsets over the marsh from three different decks. The home is a five minute walk to the ocean boardwalk. The downstairs bedroom has twin beds, cable TV and a private bathroom. The upstairs bedrooms consist of a huge master bedroom (King bed) and bath, with cable TV and private access to the sun deck; another master bedroom (Queen bed) and bath with cable TV and private access to sundeck; another bedroom with twin beds with a shared bath, and a bunk room with a twin over double bunk bed with shared bath. There are tons of outdoor living spaces...a huge screened porch with dining and sitting area! ....a large sundeck with breathtaking golf and ocean views. And a shaded back deck for grilling while watching tranquil views of the lagoon and sunset. The home has a well equipped kitchen, large dining room, a large living room for games or conversation and separate TV room (den) with a large flat screen TV. There is also a very private outside shower with hot/cold water. A baby crib and high chair is available for your use. Amenity Cards are also made available with this home AT NO ADDITIONAL CHARGE. This is a Non-Smoking Villa and Pets are NOT Allowed. We have owned and rented vacation property on Seabrook since 2003. Our children have spent many summers on Seabrook. We owned a Sealoft for many years and decided that we simply needed more space. We are pleased to share Camp Carroll with you! The beach! It is wide, uncrowded and pristine and you can easily walk to it from this house. There are no houses or condos looming over you on Seabrook's North Beach. Seabrook is like a country club community on the beach and the amenities are first class! We wanted access to tennis and golf. We aren't fans of lazy vacations -- but there are plenty of places for just that on the island. The proximity to Charleston is also a plus if you want to go to the aquarium, explore the plethora of civil war history, attend the Spoleto Festival or just walk around a beautiful, one of a kind, southern city. Our house is perfect for extended families. With 5 bedrooms 4.5 bathrooms and two living areas and all of the outdoor living is plenty of space to spread out! My favorite space? 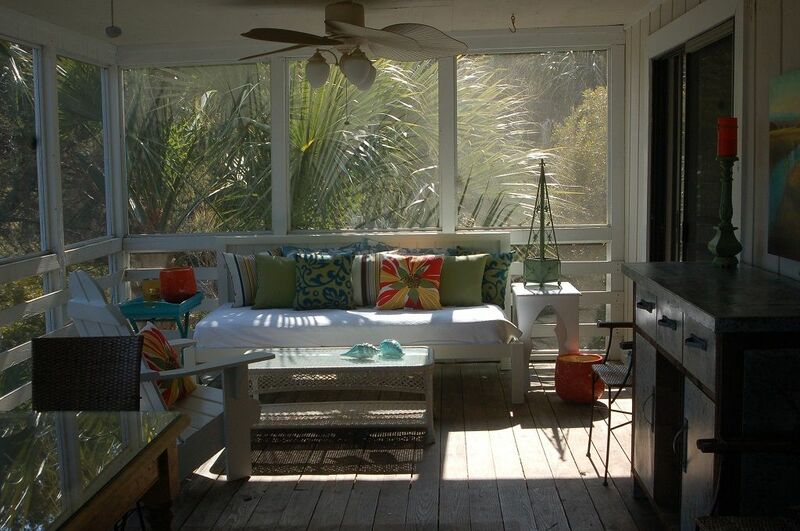 Easy daybed on the screened porch with a good book! And don't discount our fabulous views off of the front and back decks day and night. also dining for two at bar, dining for six on porch, dining for four on back deck. Very appropriate for our three families. Needs upgrading but we really didnt care. Great neighborhood. Nice pools, Great beach. Loved the gators in the back canal. Quiet. Needs more utensils. There were 11 of us. Good location. Charleston only 45 minutes. Fly fished in the low country. One flounder on a fly (Ha - believe that? It's true.) and three red drum. 13 mile loop for bike riding. Nice private decks. Thanks for the nice review Mark. I’m glad you had a nice stay. Regarding the lack of utensils, someone in your party had placed 7 of our forks in your cooler to take to the beach and forgot to take them back out. She mailed them back to me last week. Lol. I’m glad I was the next person in the house. We are planning a big renovation this Fall so come back sometime! My husband and I, along with our 4 teenage daughters and my parents had plenty of space!! The house was plenty big for all of us, no one fighting over bathroom time. The location is great for beach and club activities, and the view of the Fourth of July fireworks from the nearby golf course was great!! The kitchen is small, but very well stocked with everything we needed and it was clean. This house was perfect for two families with small children. The location was ideal, walking distance to the beach and on the golf course. With small kids, I'd recommend driving to the pools unless you have bicycles! (Just to make your life easier.) The process for getting the amenity cards was easy and the information provided by the owner in advance was ideal for making us prepared for what to expect. We would definitely recommend this house to our friends and family. Thank you for the nice review, Marianne. We certainly enjoyed having you all stay at our place. I'm so glad you all had a nice vacation! The house was not maintained to a level represented in pictures in excess of 3 years old. The house was damanged, poorly maintained both outside and in. The location was prime A+. The owners need to either invest in their house to return it to the level of their photographic advertising, or they should update their pictures to 2017. We would recommend Anyone renting the house ask for updated photographs before agreeing to rent. It was sad for us to see houses we had passed on for similar money in much better condition once we got on Island. The owner was nice but, there was little they could do once we were in the house to right the situation. I am not surprised by Matt's review. He let me know that his wife, a published interior designer who is featured on HGTV, was not happy with our beach house. The house was built in the late 70's on a fabulous lot overlooking the fairway and ocean. Cosmetic updates were made in 2009. We bought new furnishings in 2011. The house is only occupied three months a year so it does not get a lot of wear and tear. I disagree that the photos posted do not reflect the actual rooms. I could re-take the photos today, and they would look exactly like the ones in the listing, with the exception of the turquoise chair in the TV room which is presently at the reupholsterer being recovered. I acknowledge that the shrubbery out front is much higher than the photo shows. I will be changing out that photo. And, the back yard photo would show an added fishing dock that we have had built since the photos were taken. I will replace that one too. Regarding the house being damaged, I explained to Matt in advance of his arrival that our new AC units were too cold for the existing ductwork, thus resulting in some water damage from condensation in the master bedroom closet. I had repairmen out to look at it prior to his visit, and they said that it could not be repaired until the fall when we will be replacing the ductwork. I am truly sorry that Matt and his family did not enjoy our house because I want everyone who visits our home to have a wonderful experience. This is the first bad review that I have ever received. Most of our guests enjoy the casual comfort of our home, as well as the wonderful fairway, lagoon and ocean views. If future guests have any concerns, please contact me and I will be happy to send additional photos and answer any of your concerns. Plenty of room and all the amenities you need for a great week away. Thank you Stephanie! I'm so glad you liked our house and that you had a wonderful vacation at Seabrook! We had a wonderful stay at this lovely, non smoking home. It was a short walk to the beach and the grandchildren fished off the back dock. Plenty of room for our 3 families, with a TV in almost every room, the guys had no problem watching the football games. The kids enjoyed the huge indoor pool. The owner gave us lots of info on local restaurants and amenities which was very helpful. The weather was gorgeous so the outdoor areas were a definite plus.